Still looking for something special to do for Valentine’s weekend? Bath County, VA is hosting a Winter Chill Getaway Weekend beginning Thursday, February 14 – 17, 2019. On Thursday evening, Valentine’s Day, area restaurants are offering special romantic dining menus designed to impress your taste buds. On Friday, visit Bacova Beer Company, Hot Springs Virginia’s new microbrewery for traditionally brewed beer and listen to live music from Mark Whitney. To learn more about Bacova Beer, visit their website at www.bacovabeer.com. Saturday Night features renowned Jazz trumpeter/bandleader Etienne Charles at Garth Newel Music Center. Enjoy just the concert or include the before concert picnic starting at 6 pm. Visit http://www.garthnewel.org/event/american-made-etienne-charles/ for tickets and more information. Sunday afternoon features a Blind Tasting Showdown at Snead’s 1912 Steak. Test your wine tasting expertise with a flight of 6 wines. Tickets are $20 per person and participation is limited. More information can be found at www.sneads1912.com/event/blind-tasting-showdown/. Omni Homestead Resort will be offering skiing and snowboarding. Contact Omni at 540-839-1766 for pricing and details. Even though it is winter, the scenic hiking trails in Bath County are open and provide a different experience and views now that the leaves are down. 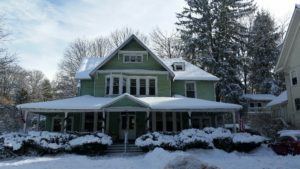 Enjoy a hike in the mountains of Bath County, and return to your B&B to warm up with hot chocolate by the fireplace. Visit www.discoverbath.com for things to do in Bath County, VA.
As part of the celebration weekend, Vine Cottage Inn is offering a 3 night, 4 day package including $50 toward dinner at an area restaurant, 2 beer flights and a growler from Bacova Beer Company, ½ dozen roses, and our delicious 3 course breakfast each morning. Rates for the inclusive package begin at $443.00 plus tax. 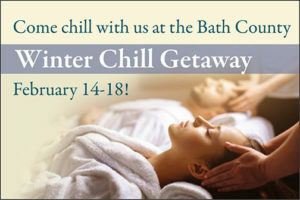 Please contact us directly at 540-839-2422 to reserve your Winter Chill Getaway Package today! More information can be found at www.vinecottageinn.com/packages.htm. If you can only do two nights, those packages begin at $375.00 plus tax. We only have a few rooms left, so don’t wait!